Welcome to the NVSS Website! 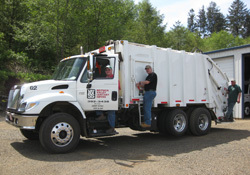 Nestucca Valley Sanitary Service has been serving South Tillamook County for more than 60 years! 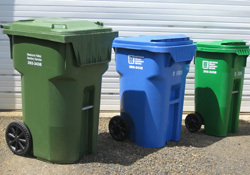 This website is here to help you find the services to dispose of your garbage, maximize your recycling and keep Oregon clean and green. Take a look around the site. You'll find lots of tips and useful information. If you have questions or comments for us, please go to our CONTACT page. We have a new website address and a new email address! Nestucca Valley Sanitary Service has a new website address, www.nvssgarbage.com. Same great site, same great service, fewer keystrokes. If you love typing our old address, don't worry; it will still get you here. We also have new email addresses. For general information, send your emails to info@nvssgarbage.com. See our CONTACT page for more information. Reduce your carbon footprint and convert your "fuel" savings to "free time" in your personal tank! Sign up with NVSS for garbage service and take some credit for reducing your carbon footprint! Take advantage of our reliable, clean and convenient service as we pass by your home and/or business. Choose from a variety of services to fit your lifestyle! Full time residents can choose between One Can Once a Week and One Can Every Other Week. On Call Service is convenient and available to second home owners and vacation rental homes. This service is popular because you chose the number of pick-ups you need and schedule the pickup dates! We've got what it takes to get the job done! Nestucca Valley Sanitary Service can meet your needs for household clean-outs, remodeling and construction projects, too! We have multiple container sizes to do your job quickly and efficiently as well as disposing materials legally and environmentally safe at the Tillamook Transfer Station. New! Pay your bill with ease with On-Line Bill Pay. Nestucca Valley Sanitary Service now offers on-line bill pay, a secure way to pay your bill quickly and easily. The process is simple! Just click the button below to begin. Oregon has long had a national reputation as a leader in recycling. Our "Bottle Bill," which became law in 1971, was the first in the nation, and has greatly reduced the amount of soft drink and beer containers littering our landscape and filling Oregon landfills.